About this Small Rosewood Pocket Knife:Small pocket knife features gold accent on rich rosewood handle. Materials: Blade: stainless steel, Body: rosewood Due to this product's variance in composition, laser engraving may produce different shades of imprint. Special Instructions:Rush Service:The standard imprint method, 1-color/ 1-location is available. About this Handy Mate Multi - Tool with Hammer:It's hammer time. 12-in-1 hammer multi-tool includes hammer, pliers, wire cutter, nail file, flat heat screw driver, bottle opener, can opener, saw, serrated blade, Phillips head screw driver, blade and wrench. Manufactured By Leeds. Materials: Stainless SteelSpecial Instructions:Other imprint methods/areas may be available; please call for details. Please note that product images may not depict the standard imprint method included in pricing. About this Wooden 13 function Pocket Knife:Wooden 13 function pocket knife with a high class appeal. Includes, flashlight, flat head screwdriver, can opener, bottle opener, scissors, saw, knife, corkscrew, nail file, finger nail pick, toothpick, Phillips head screwdriver, awl, and key ring. Manufactured By Leeds. Materials: Stainless SteelSpecial Instructions:Other imprint methods/areas may be available; please call for details. Please note that product images may not depict the standard imprint method included in pricing. About this 8- Function Stainless Steel Knife:Stainless steel knife, nail file, scissors, can opener, bottle opener/flat-head screwdriver, Phillips head screwdriver, corkscrew and a mini split ring.Material: Stainless Steel.Special Instructions:1 Day Rush, available upon request for 1 color, 1 imprint location orders. About this 5- Function Knife:Includes stainless steel knife, spring-loaded scissors, tweezers, nail file, plastic toothpick and mini metal split ring.Material: Stainless steel with plastic casing. Related Search Terms: Function KnifeSpecial Instructions:1 Day Rush, available upon request for 1 color, 1 imprint location orders. About this Survivor 3- in -1 Rescue Knife:3 in 1 Rescue Knife. Three-in-one emergency safety tool includes impact hammer to break through glass, seatbelt cutter and oxidized knife. Easily fits into your pocket and includes a belt clip. Manufactured By Leeds. Materials: Stainless SteelSpecial Instructions:Other imprint methods/areas may be available; please call for details. Please note that product images may not depict the standard imprint method included in pricing. About this High Sierra(R) Mini Multi - Tool:11 function tool includes pliers, 2 blades, 3 driver bits (2mm-4mm), serrated blade, bottle opener, can opener, wire cutter and file. Manufactured By Leeds. Note: Instructions Included: No Materials: Stainless SteelSpecial Instructions:Other imprint methods/areas may be available; please call for details. Please note that product images may not depict the standard imprint method included in pricing. About this Vito Stainless Steel Pocket Knife:Knife, scissors, bottle opener, can opener, Phillips screwdriver, flathead screwdriver, nail file, corkscrew, punch, split ring, steel construction. Finish / Material: Steel. Stainless Steel Tools.Special Instructions:Rush Service:1. Purchase Order must clearly state artwork instructions and logo to be used.2. One Color/One Location Imprint Only. About this 13- Function Stainless Steel Pliers:Functions include pliers with 3 gripping surfaces, wire cutter, small knife, large knife, metal/wood file, standard ruler/scale, can piercer, bottle opener, flathead screwdriver, Phillips-head screwdriver, punch and fish scaler/hook remover.Includes UltraHyde pouch with snap closure.Material: Stainless Steel. Related Search Terms: Plier Special Instructions:1 Day Rush, available upon request for 1 color, 1 imprint location orders. About this Skoda 12 Function Pocket Knife:Includes pocket knife, bottle opener, cork screw, screwdriver, can opener, scissors, nail file, hole marker, saw, pinhole, wire cutter and file.Includes mini metal split key ring.Material: Stainless Steel.Special Instructions:1 Day Rush, available upon request for 1 color, 1 imprint location orders. About this Monterey 12- in -1 Pocket Knife:Knife, scissors, bottle opener, can opener, Phillips screwdriver, flathead screwdriver, nail file, corkscrew, punch, split ring, stainless steel construction, anodized aluminum handle. Finish / Material: Steel, Aluminum.Special Instructions:Rush Service:1. Purchase Order must clearly state artwork instructions and logo to be used.2. One Color/One Location Imprint Only. About this Folding Knife:Folding knife features genuine carbon fiber inlay handle, 3 3/4" stainless steel blade, fast-open locking action, stainless steel body, belt clip and carry pouch with belt loop. Opens to 8 1/8". Finish / Material: Stainless Steel, Carbon Fiber.Special Instructions:Rush Service:1. Purchase Order must clearly state artwork instructions and logo to be used.2. One Color/One Location Imprint Only. About this 3 In 1 Multi - Function Tool:Button Cell Batteries IncludedFlip Light And Twist End To Turn On/Off.Includes Knife, White LED Light And Bottle Opener.Special Instructions:Multicolor imprint is available, Please call for service.Rush Service:Catalog Quantities Only.One Color And One Location. About this 5 In 1 Multi - Function Tool:Button Cell Batteries Included.Inlcudes Knife, White LED Light, Bottle/Can Opener, Matching Carabiner And Pen With Rubber Grip.Slide Button To Turn On/Off.Special Instructions:Rush Service:Catalog Quantities Only.One Color And One Location. About this Workmate Pro 16- Function Multi - Tool:16 function tool includes pliers, 3 knife blades, 3 flathead screwdrivers, Phillips head screwdriver, bottle opener, can opener, wire cutter, dual function file, fish scaler, and ruler. Manufactured By Leeds. Note: Instructions Included: No Materials: Stainless SteelSpecial Instructions:Other imprint methods/areas may be available; please call for details. Please note that product images may not depict the standard imprint method included in pricing. About this High Sierra(R) 15- Function Multi - Tool:15 function tool includes can and bottle opener, Phillips head screw driver, 3 driver bits (2mm-4mm bits), three blades (3mm-5mm), serrated blade, pliers, needle nose pliers, wire cutter, and dual-function file. High-end non-stick easy care coating. Manufactured By Leeds. Note: Instructions Included: No Materials: Stainless SteelSpecial Instructions:Other imprint methods/areas may be available; please call for details. Please note that product images may not depict the standard imprint method included in pricing. About this Oblong 9 Function Pocket Knife:Be ready for any situation with this 9 function pocket knife. Includes cork screw, nail file, nail picker, Phillips head screwdriver, flat head screwdriver, can opener, bottle opener, knife, scissors, and key ring. Manufactured By Leeds. Materials: Stainless SteelSpecial Instructions:Other imprint methods/areas may be available; please call for details. Please note that product images may not depict the standard imprint method included in pricing. About this 13- Function Stainless Steel Pliers:Functions include pliers with 3 gripping surfaces, wire cutter, small knife, large knife, metal/wood file, standard ruler/scale, can piercer, bottle opener, flathead screwdriver, Phillips-head screwdriver, punch and fish scaler/hook remover.Includes UltraHyde pouch with snap closure.Material: Stainless steel with plastic handle casing. Related Search Terms: Plier Special Instructions:1 Day Rush, available upon request for 1 color, 1 imprint location orders. About this The Tonca 11- Function Mini Multi - Tool:Functions include pliers, knife blade, Phillips-head screwdriver, flat-head screwdriver (small and large), bottle opener, can opener, saw blade and nail file.Includes nylon storage pouch with belt loop.Material: Aluminum case with stainless steel tools. About this Multi - Function Tool In Case:Includes Needle Nose Pliers, Wire Cutter, Small & Large Knife, Metal/Wood File, Standard Ruler/Scale, Bottle Opener, Flat Head/Phillips Head Screwdriver, Punch And Fish Scaler/Hook Remover.Special Instructions:Rush Service:Catalog Quantities Only.One Color And One Location. About this Small Rosewood Pocket Knife - Silver:Small pocket knife features silver accent on rich rosewood handle. Materials: Blade: metal, Body: rosewood Due to this product's variance in composition, laser engraving may produce different shades of imprint. Special Instructions:Rush Service:The standard imprint method, 1-color/ 1-location is available. About this Lynx Pocket Knife:Loaded with useful features, this handy pocket knife will be with your customers for many years to come. Materials: Stainless Steel Related Search Terms: Pocket KnifeSpecial Instructions:Rush Service:The standard imprint method, 1-color/ 1-location is available. About this High Sierra Renegade Multi Tool:High quality High Sierra Multi-tool perfect for any job! Functions include pliers, wire cutter, can opener, bottle opener, 3 flat head screwdrivers, 2 knife blades, serrated knife blade (2.25" 1"), file. Includes carrying pouch. High-end non-stick easy care coating. Manufactured By Leeds. Material: Stainless SteelSpecial Instructions:Other imprint methods/areas may be available; please call for details. Please note that product images may not depict the standard imprint method included in pricing. About this Leatherman SKELETOOL:100% Stainless Steel Body, 6061-T6 Aluminum Handle Insert, Pliers, Regular Pliers, Wire Cutters, Hard-wire Cutters, 420HC Combo Knife, Bit Driver, Carabineer Clip/Bottle Opener, Removable Pocket Clip. About this Micro Multi Tool:Constructed out of Stainless Steel and Aluminum this multi tool includes mini pliers, Wire cutter, bottle opener, small knife, serrated blade, Phillips screwdriver and carabiner. About this 16- in -1 Flashlight Laser Multi - Tool:16-in-one multi-tool features include 4 piece socket set, socket connecting rod, bottle opener, knife,saw, 2 Phillips head screwdrivers, 2 straight screwdrivers, hex key, punch, 0.75W LED flashlight and laser pointer. Material: Double Wall Plastic. Manufactured By Leeds.Special Instructions:Other imprint methods/areas may be available; please call for details. Please note that product images may not depict the standard imprint method included in pricing. Thank you Colin, Del and Bailey! Our pocket knives are high quality, and this top selling custom pocket knife is the most popular for customers. 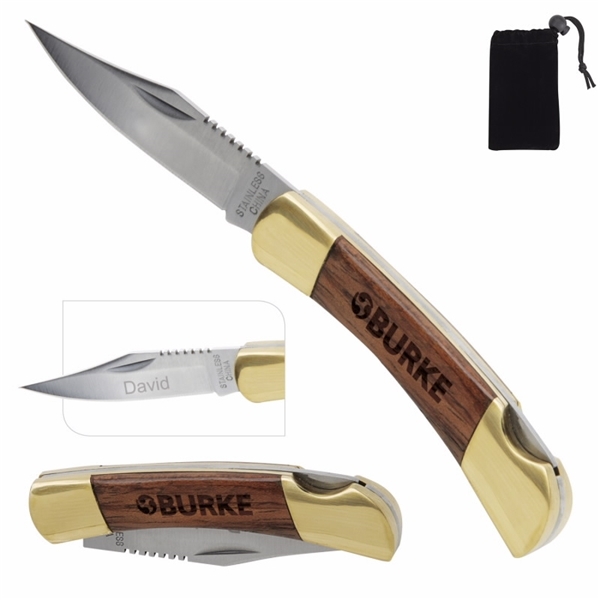 Purchase the most favored pocket knife in our selection. Its imprint style will definitely attract your attention! Custom engraved pocket knives make a great fathers day gift. Materials: Blade: stainless steel, Body: rosewood. Thank you Melissa and Landon! We know custom pocket knives make a great giveaway for any outdoor experience, whether it’s camping or fishing, a knife is always helpful to have. Our Multi-Purpose Knife has extra features to help in any situation. Its multi purpose function gives an extra boost to our promotional knife. Includes Knife, Scissors, Nail File, Toothpick And Tweezers. Purchase your Multi-Purpose Knife today! Thank you Dakota and Alexis! We always try to make sure our products come out just the way our customer had envisioned. We want your event to be a successful one! Our Flat Single Blade Knife Money Clip is useful for those who carry their cash with them. They could also carry around a safety knife with this promotional knife. With over 100 customizable pocket knives available in our selection, we have different types that will be the sharp one of your choice. From the most technical knives, to the simplest, we have them all available at an affordable price. We have the perfect knife in our selection just for you! Don’t cut your chances of making our pocket knives a hit at your next event! Pocket knives are great for any event! You can give them at a safety tradeshow, or camping tradeshow. People carry around pocket knives for convenience. With a pocket knife at hand, you could cut through anything! Maybe you need more of a technical knife? Well, we have knives available that contain a bottle opener, cork screw, screwdriver, nail file, can opener, saw, wire cutter, and more! 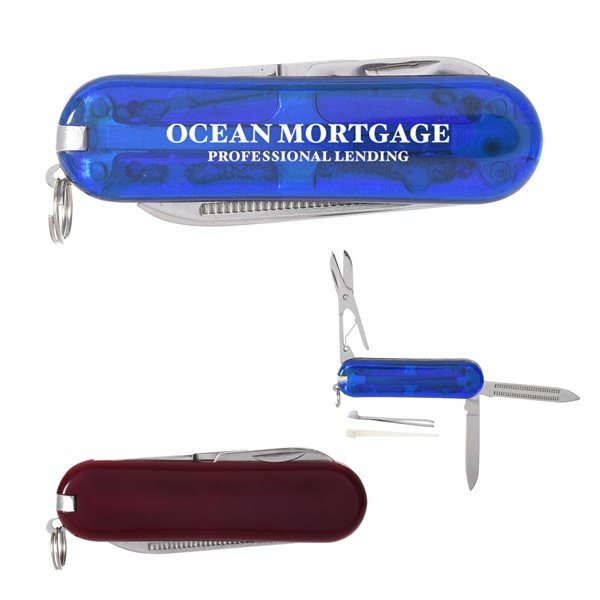 Our custom pocket knives are specially priced and professionally imprinted to vividly promote your brand. Search our site for a wide selection of promo knives and find utility knives, single blade knife money clips and more! See for yourself just how high AnyPromo’s standards are when it comes to brand impact. Click through our inventory of custom promotional pocket knives on sale now. Here is a snapshot of our selection of promotional knives currently available. We’re ready to help expedite your order, so give us a call! Pocket knives are great for any emergency situation. If you ever need to cut something in an emergency, pocket knives will help cut you free. You can give these pocket knives at almost any trade show. Let your company logo be placed on the center of the knife. Our featured list contains different types of knives, from our most technical, to our most simple. If you have any questions, feel free to contact our customer service team. They are available by phone and through live chat.